Allison Marsh is director of Public History at the University of South Carolina. She is also chair of the Curriculum and Training Committee of the National Council on Public History. Marsh, Allison. 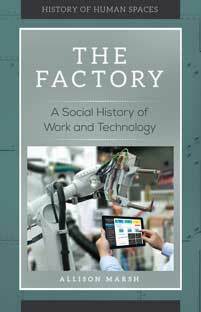 The Factory: A Social History of Work and Technology. Greenwood, 2018. ABC-CLIO, publisher.abc-clio.com/9781440853333. The book goes beyond the assembly line to examine the physical environment of the industrial landscape.